I Have Periodontitis – Are Dental Implants in Colorado Springs for Me? You’ve been living with missing teeth long enough and have decided that it’s time to do something about it. 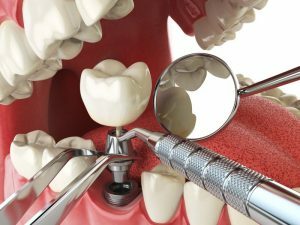 You’ve learned that dental implants in Colorado Springs is the best solution, but you have one item of concern; you’ve been diagnosed with periodontitis (advanced gum disease). Can you still go ahead and have an implant placed? Your local dentist weighs in to explain how the dental implant process works and answer your questions. A dental implant is a surgically inserted titanium post that is attached to your underlying jawbone and replaces the roots of your missing teeth. One of the greatest benefits of this procedure is that in attaching to your existing bone, it triggers the continued development of new bone cells. An abutment is anchored to the implant and allows either a crown or bridge to be attached to it. The longevity of all the components involved depends on how well the implant seats and fuses with your existing bone. Thus, it’s important for your underlying bone structure to be healthy. Over time, advanced gum disease can lead to bone loss, as the infection spreads. Therefore, this condition must be treated before an implant is placed. Otherwise, there’s a higher probability of it failing. Your dentist will examine your oral cavity thoroughly before any work is done. If it’s discovered that you’re lacking a sufficient amount of bone mass, then the specialist may recommend a regenerative procedure, which includes bone grafting. This involves taking healthy bone from another part of your body or from a bone bank and using it to build up the lower jaw, so that you can have a successful implant procedure done. Before this step is taken, though, your specialist will still have to treat your advanced gum disease. One of the most recommended forms of treating advanced gum disease is a pocket reduction procedure. Your dentist will fold back your gum tissue and remove the bacteria lodged at your roots. Additionally, he or she will smooth the rough surfaces along the roots of your teeth to prevent further bacterial infections. After you’ve received periodontal therapy in Colorado Springs and you’ve had time to recover, you’ll then be able to move forward with the other stages of being fully restored. Keep in mind, though, that once you’ve been treated for advanced gum disease, your dentist will need to see you more often than just the six-month, standard visitation times. Once your infection has been cleared away, your implant is successfully placed, and you’re fitted with a permanent fixture, you’ll have a completely restored smile. To learn more about this procedure, reach out to your implant specialist today! Dr. Karl Lackler earned his D.D.S. degree and M.S. in Periodontics from the University of Texas Health Sciences Center in San Antonio. In addition to caring for patients, he has taught at a post-doctoral level and has been published in several peer-review journals. Dr. Lackler uses his expertise to ensure patients the absolute best in dental care at Rocky Mountain Periodontal Specialists, LLC. He can be reached for more information through his website. Comments Off on I Have Periodontitis – Are Dental Implants in Colorado Springs for Me?